The walls of the main office of the Conservatory of Recording Arts & Sciences in Tempe, Ariz., are nearly covered with gold records featuring the work of the school’s graduates. They’re discs awarded to engineers, mixing assistants and assistant engineers on albums by acts such as Pink, the Goo Goo Dolls, Brooks & Dunn, Outkast and many others. It’s a serious school, and it draws serious students of the audio arts and sciences from across the nation to its busy campuses in Tempe and Gilbert, Ariz.
And in their educations, as in the real world of audio, they students are constantly using Fender gear. Every hour of every day, in fact—the campus is open around the clock, seven days a week. You can bet that someone is always mic-ing up a Fender amp, plugging in a Fender guitar or equalizing a signal from a Fender bass. Students train at the fully accredited and internationally acclaimed school for work in the music, film, television and radio industries. It’s a 30-week course, followed by a 280-hour internship. It’s simple; the Conservatory trains you, then finds you an internship and, ultimately, a job. About 900 will graduate this year. Last year, three Conservatory graduates won Grammy Awards. The school was founded in New York in 1980. It was moved to Phoenix in 1986, and to the 14,500-square-foot Tempe campus in 1995. The 25,000-square-foot Gilbert campus opened in November 2003 in response to a two-year waiting list for enrollment. 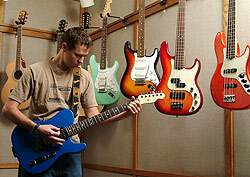 The relationship with Fender dates back to 1999, when Fender delivered a shipment of amps to the school. Today, you’ll find a variety of Fender products in various Conservatory studios, classrooms and labs—Telecaster guitars, Precision and Jazz basses, Cyber Series amps and, as of July 2005, some spanking-new Metalhead Series amps. 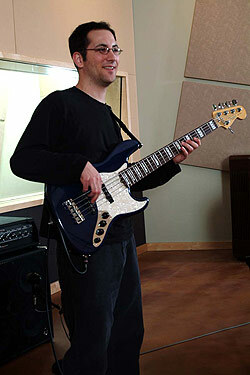 Visit the Conservatory of Recording Arts & Sciences online at www.cras.org. 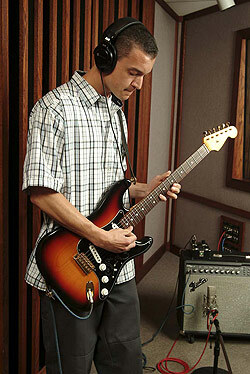 Conservatory students use a variety of Fender instruments and amplifiers.